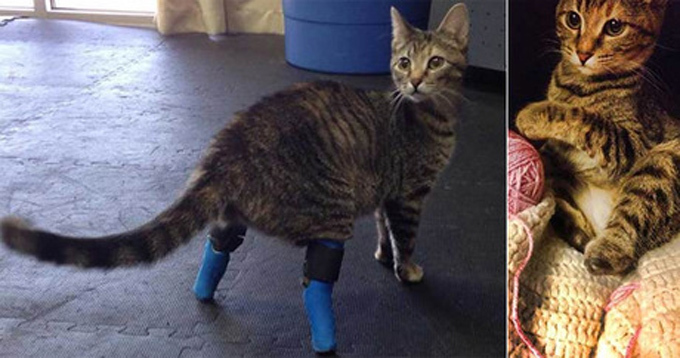 Boots with a pair of temporary prosthetics, jokingly called “house slippers” (left); the feline without prosthetics (right). A video of a very special cat is inspiring YouTube visitors all around the globe. When Boots was barely two weeks old, she was dumped in an overnight drop box at an animal shelter. Shelter workers were horrified when they discovered she was missing her two back feet. They wondered whether it might be more humane to euthanize the poor two-legged kitten. But someone saw something in Boots. Boots was transferred to a Denver, Colorado-area pet foster group called Life is Better Rescue, where she was bottle fed and kept warm. Soon she could eat on her own. As the days went by, little Boots grew healthier and stronger, and it was clear she had a real shot at survival. Still the question remained — how did this tiny kitten lose her legs? According to the Life is Better Rescue website, veterinarians have confirmed that Boots’s legs were not missing due to a congenital defect or some sort of natural condition. In December, Boots was fitted with a special pair of temporary prosthetics, her blue “house slippers,” the rescue jokes. Her new legs have helped Boots learn how to be as mobile and playful as any kitten her age. Denver, Colo., resident and University of Colorado research assistant Megan Brocato took Boots in when she was 6 weeks old, intending to foster the two-legged kitten until she was fully recovered and could find a forever home. But Brocato quickly found she was falling hard for the cutest cat on two legs. She has since decided to adopt Boots. Brocato was delighted the first time she saw Boots’s unique method of navigating the stairs. “Sometimes she does it with three legs — like a tripod,” Brocato describes, saying Boots uses one of her prosthetic legs to help her down the stairs occasionally. But Boots’s two-legged technique is Brocato’s favorite. To get down the stairs, Boots lifts her “house slippers” into the air and uses only her front legs to quickly descend a staircase. “I think she gets down fastest on her front though,” Brocato tells the Denver Post. It’s quite a sight to see, Brocato says. One day, Brocato decided to try and capture Boots’s moves, which she describes as the “Double Amputee Cat Flying Handstand,” on camera. The resulting video has been viewed nearly 140,000 times. This summer, Boots is set to undergo surgery to reshape her legs and help better prepare her for a set of permanent prosthetics.